The Open Water Diver course is the world’s most popular scuba course, and has introduced millions of people to the adventurous diving lifestyle. The fun part about this course is . . . well, just about all of it because learning to dive is incredible. You breathe underwater for the first time (something you’ll never forget) and learn what you need to know to become a certified diver. 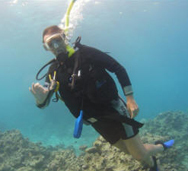 During the course, you’ll make at least 5 dives in a confined water environment and four dives at local dive sites under the supervision of your Instructor. How much fun scuba diving is. Scuba diving equipment considerations for your local diving environment. How to plan, and execute actual dives. How to prevent and manage problems. 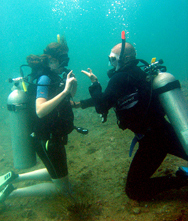 Knowledge Development (home study or in a classroom) to understand basic principles of scuba diving. If you’ve tried diving through a Discover Scuba Diving experience, the skills you learned may be credited towards a portion of the full Open Water Diver course certification. 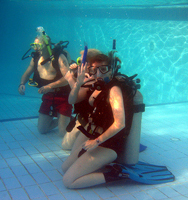 In the Open Water Diver course, you learn to use basic scuba gear and standard accessories. The equipment you wear varies somewhat, depending upon the temperate of the water. The Open Water Diver manual covers what you need to know about basic scuba diving skills, terminology and safety procedures. For each concept you’ll read a description and watch a video demonstration. Then you’ll jump into a pool-like environment to practice these skills with your instructor. Later, as a certified diver, use the course materials as a reference guide for future diving adventures and to review what you learned.